With the holiday season right around the corner, I must say that I love getting in the gift-giving mood! I love giving gifts and watching the happiness, surprise, and love across the faces of my friends and family. Isn’t that such a great feeling? Of course, I love gift-giving for all the typical reasons (because it’s heartwarming and fun, yada yada) but I’ll tell you a secret. There’s another reason why I love giving gifts. It’s not about spending the most money, or winning the best-gift-of-the-year award. 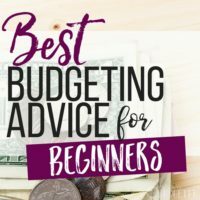 You guys, I LOVE gift-giving because I just can’t pass up the challenge of finding the best budget-friendly gift ideas! Okay, maybe I sound like a total weirdo here, but I love a bargain-hunting challenge. I love finding ways I can give awesome gifts that don’t break my budget. A few years back my family implemented a $10 gift challenge at Christmas (they also love a good challenge). HOLY MOLY, you guys, it was a total blast! I found an awesome video-game gift for my dad. Put together the perfect car-kit for my mom and came in UNDER my budget. We had so much fun with it that we made it a tradition. It’s those gifts that let me know someone was thinking about me and they “get” me. Those are the most meaningful. Plus, I love the added challenge of getting creative and finding a gift I know someone will love, knowing it was picked out especially for them! You don’t need to spend tons of money or go into debt this Christmas. In fact, you absolutely shouldn’t go into debt this Christmas—DON’T! 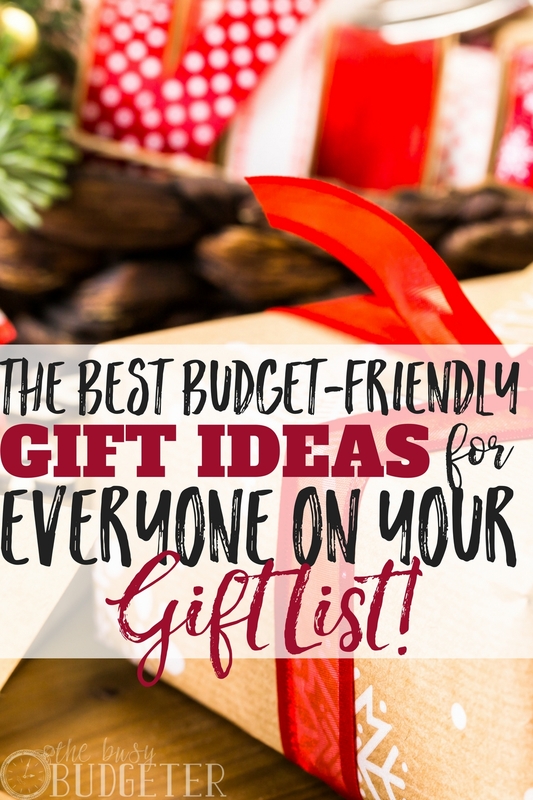 Check out these awesome budget-friendly gift ideas to cover everyone on your list for well under your budget! Okay, first of all, let me just say—photo gifts rule! I used to be a huuuuge scrapbooker during the day and my love of photos still runs strong. I don’t have crazy photography skills, but I love looking back through candid shots of my family and the good times we’ve had. Best of all, photos are super cheap. If you’re a member of Snapfish you can often get free prints with a coupon code. Walgreens, Costco and Sam’s Club all offer discounted photo printing for literally pennies. Watch for coupon codes and get photo books printed for around $10.00, which is way cheaper than scrapbooking paper and stickers. Almost all photo printers offer some type of easy book. Many work by simply selecting the photos you want, clicking a button and the book is laid out and ready to print. It’s that easy! Who doesn’t love a coffee mug printed with awesome photos from your trip, of your family or happy memories? Photo mugs are made for $10 or less. If you want to really jazz it up, add hot cocoa mix and cute mini marshmallows to enjoy in their new awesome mug! Making photo coasters is a super simple craft. You don’t need much: photos, Mod Podge, and tiles. They look really nice when you add felt to the back. Photo coasters are a great gift for a beginning crafter or teenager to create on their own. One of my favorite budget-friendly gift ideas is a framed picture – because it’s SO easy! Get frames for a buck at the dollar store, or watch Goodwill and other discount stores for inexpensive frames. If you paint or decorate the frame, it can even become part of the gift. Include a single, meaningful photo or put together a collage of memories for the frame. For under $10 get a simple calendar printed out. Kinkos and other copy shops are able to print and even spiral-bind calendars. Many photo-printing spots (like Walgreens) also offer templates online for easy drag-and-drop calendar making and printing. Everyone loves a calendar of their favorite photos from the past year. It’s a great (and easy) gift. When we did our family holiday challenge, we put together our gifts “basket-style.” Gift baskets are awesome, because it’s so fun to fill them up with all sorts of little goodies and surprises. You put together a “taste of” basket and incorporate local favorites. When we did a Taste of Virginia, we put in local chips, dogwood tree seeds and peanuts. Baskets look great, and the sky’s the limit when it comes to filling them up! Put together a “car care” basket like I did for my mom (with a mini pack of tissues, dashboard wipes, lip balm and other car necessities tucked into a trash bin for her car). You could create a spa-day basket, a kid-friendly basket, a travel-themed basket. There are so many amazing basket ideas out there. Get creative! Food’s always appreciated in gift baskets. Use sample sizes or even buy items in bulk and break them up to go in several baskets for everyone on your list! Tickets are great gifts! We often feel like we’ve got a lot of “stuff” around our house—especially with kids. I always appreciate it when someone gives a gift of tickets for a fun event or experiences, rather than another toy to pick up off the floor. If you want to give tickets, watch for great deals on Groupon! There are always cool local ideas for events, theater, tastings, art classes and more. When you find tickets on Groupon they’re often less than half the price, so it’s perfect when you’re searching for more budget-friendly gift ideas. Give your friends tickets to take a class with you or buy passes for a museum, the zoo or another fun event for family. When you give tickets as gifts, you don’t need to go super-expensive. It doesn’t need to be a U2 concert, or the Ice Capades. Watch for a simple local event. Most spouses would love date night tickets to hear a band at a café, or see a theater production. What about dance lessons or local sporting events? On Groupon and other discount ticket sites you’ll often find terrific weekend get-away deals. Find somewhere within driving distance–a nearby water park, a cute town a few hours away, a museum in the closest city. Watch for great deals on hotels (think under $40) and enjoy a family or couple’s weekend (complete with a romantic couple’s massage) away for cheap! It’s a cool gift, one that will be appreciated and remembered. Can’t find tickets for any great events? Why not create your own coupons?! These are great gifts for kids to give to family members, or couples to give to each other! Put together whole booklets of coupons good for free massages, date nights, movies together or other fun times that don’t cost a dime. Kids can give coupons to help grandma and grandpa with jobs around the house, or spending quality time together. Give a coupon for a day of creating a craft or food together, helping a friend with a job you’re great at (free babysitting is always an awesome offer) or any other service you can think of! Rather than buying another item from the store, why not roll up your sleeves and create a present! 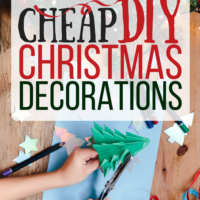 Some of us fear DIY gifts because we either aren’t crafty or we worry it will look cheap or won’t seem as meaningful. 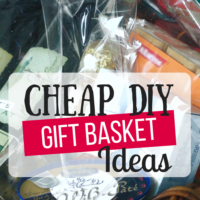 Fortunately, there are great and super-useful gifts that are really easy to DIY. Cut and sew a superhero cape for your niece or nephew. Create a microwaveable heating pack for your grandma. Put together a plant in a cute pot for your sister. Most DIY gifts fall into two categories—edible and useful. Fortunately, both types of DIY gifts are appreciated by almost everyone! So, if you aren’t crafty, consider an edible gift. Make homemade chocolates, brownies, cookies or a sweet treat. Another great edible gift idea is to cook an extra freezer-friendly dinner or soup to share with a friend. Take over the meal along with a nice loaf of bread and desert. Your friend will be thrilled when she doesn’t need to wrack her brain over what to make for dinner when company is in town or the holidays get too hectic. As far as homemade gifts go, I find it’s always best to go with a useful gift–practical but special. Candles are great for decorating. A homemade scrub, lip balm or scented lotion is a nice gift for almost any lady on your list. For guys, think of items to help them stay organized—a key hanger, a divider for their tool kit or an organizer to wrangle their video games and cords. Still not quite sure what to get the men in your life? Check out this list of creative and fun budget-friendly gift ideas for dad, grandpa, or hubby that they’ll love! One way I’ve found to save money on gifts is to use what I call the “gift cycle method.” What does this mean? Well, I buy gifts all year long. I start with a list of everyone I need to buy for during the year (birthdays, weddings, and of course Christmas). Whenever I’m out shopping, I check my list and I watch for items on deep discount. I rarely (if ever) buy an item that isn’t at least 50% off. When I find the perfect present on sale, I buy it right then and there. Then I store it in my closet until his or her birthday rolls around. I use the gift cycle method for wedding presents, baby shower gifts and other events, by buying a few great baby items or household gifts when I see them on a great sale. I go with neutral colors and keep track of ages on my list (for kids). 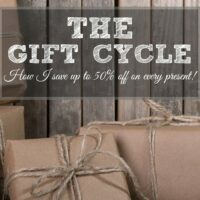 By using the gift cycle method, I save at least 50% on gifts, plus I don’t get stuck purchasing every gift in December (when money is tight). Instead I’m spreading the purchases around throughout the year. I added a line item in my budget for gifts and we use a separate account so we don’t over-spend on items all at once. Gift-giving doesn’t have to be extravagant and expensive. The holidays are the perfect time to get together with family, exchange some gifts, and spread some love! Don’t stress about breaking your budget by trying to win gift-giver of the year! Some of the best budget-friendly gift ideas might just win you that title because of how much love and personal thought went into finding the perfect gift for that special someone! So, if you want to save money this year but still give great gifts to everyone on your list—don’t sweat it! There are plenty of ways to save and still give awesome presents. What are your go-to favorite budget-friendly gift ideas? How do you save money on holiday gifts? What’s your family’s favorite holiday gift-giving tradition? This is such a timely post for the holiday season! Mr. FAF and I don’t usually exchange Xmas gift. We also don’t exchange gifts with friends and family. We don’t send them postcards either. That lowers our Xmas spending by a lot. We don’t really exchange gifts with the family anymore except maybe a bottle of wine or the photo ideas you mention are fantasic! For us it is the kids who eat up much of the budget. We buy for our own and then my sister and I each buy for each other’s kids too. As a family we have a lot of people to buy for – so a few years ago we decided to limit gift spending to £15 a present. It’s amazing what you can buy for under this – and I always challenge myself to spend even less while still getting something amazing. In todays world where it’s all spend, spend, spend, it makes a refreshing change to limit things and make Christmas about something more…. Great ideas. Except for immediate kin, I only purchase gifts for family members under the age of 18 and cap each present at $20. I’ve gotten good at buying them on sale, so gift giving has been pretty easy lately. Another good idea it to actually ask people what they would like, or to get them to share a list with the family. That way you know the gift you purchase is wanted or needed. Katie@MySweetHomeLife recently posted…Simple strategies to implement what you learn. I love these ideas, especially the gift cycle! I see great deals all the time, but think I should just wait for whatever reason. But then you end up spending so much money at once. We do a lot of DIY gifts, especially for our two families that do dirty santa – everyone seems to love the unique, handmade gifts!